This stunning Personalised Baby Photo Print is a truly special way to celebrate your little one's first year. This personalised print is such a thoughtful way to share those precious moments together. Printed with 12 of your most treasured memories and a personalised message, this framed print is perfect to celebrate Mother's Day, Baby's first year, favourite adventures and more. 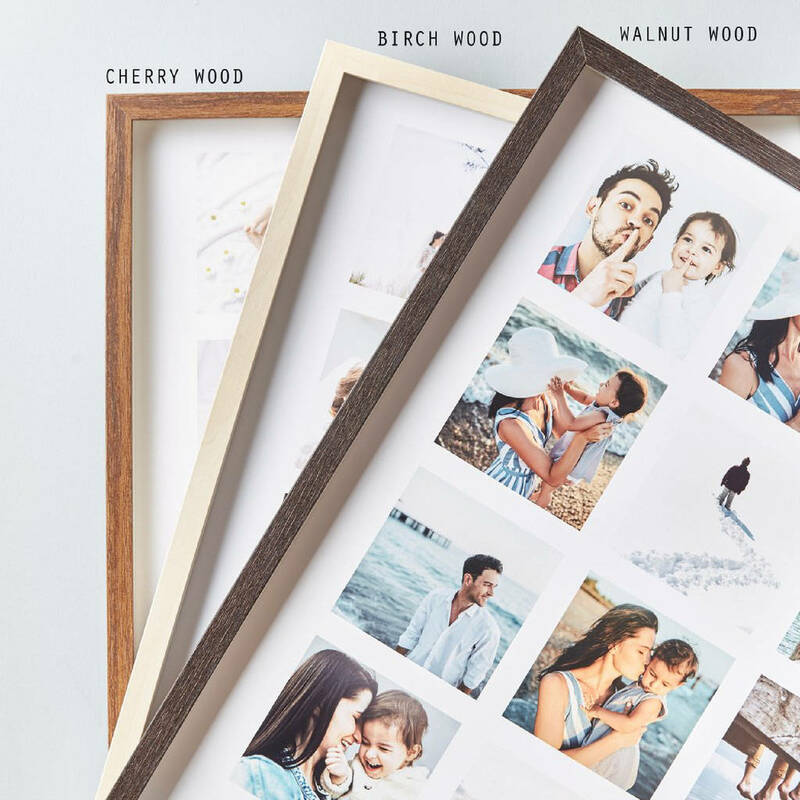 These beautiful frames are available in three sizes and three different wood finishes; Birch, Cherry and Walnut. Please note: Our large frame takes an extra day for delivery as it is sent via a tracked courier delivery. Please take this into account when placing your order. These make a thoughtful gift for all occasions, Birthdays, Weddings, Anniversaries, Valentines, Christmas or a perfect treat for that special friend or family member. Our personalised prints are made using high quality photo card and are beautifully finished in a wooden box frame by our in house team. Sending your photos couldn't be easier, once your order has been placed you will need to go to ‘my orders’ section. Here you can then create an order enquiry where you can attach the 12 photos you would like to use. If you have a particular order that you would like your photos to appear, please ensure that each photo is numbered. We will start with number 1 in the top left corner and work to the right to create your framed print. If you do not mind the order then please let us know, and we can work out the best composition for you.